The book itself is a fast-moving, engrossing horror novel with engaging characters, compelling motivations, an interesting premise, and a well-planned and executed plot. It succeeds in being truly scary in many places and is fairly creepy throughout. Enough emotional connection is established among the characters to make their fates important. If there is a weakness in the book, it is the language. Though generally effective, many of the metaphors and dialogue elements tend towards cliché, and word choices and phrase structures are rarely original. This does not interfere directly with enjoyment of the story, but it does keep it from rising to the top tier of horror literature. The narration of the audiobook, however, is truly brilliant, and ultimately what got me into the book in the first place and kept me engaged throughout. Folly Blaine's calm, collected voice is appropriately chilling when applied to the books gruesome content, and her use of varied inflections and intonations imbues the characters with richer identities than offered by the raw source material. She has an ideal register for narration and I look forward to listening to other books read by her in the future. 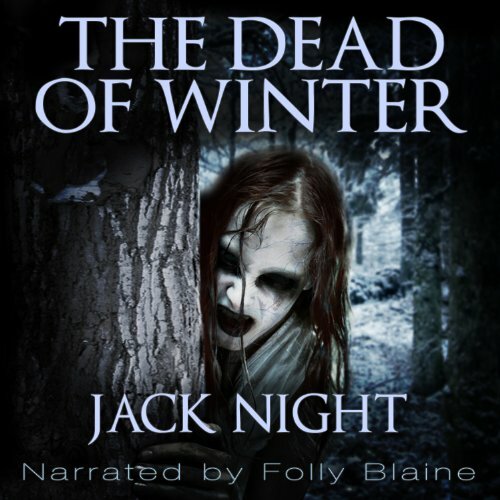 Overall, I recommend this audiobook highly to anyone looking for a creepy small-town mystery wrapped in the trappings of a grisly horror tale. What made the experience of listening to The Dead of Winter the most enjoyable? I had already read this book when it first came out and was enthralled by the story. Its one of the few novels I've read that created such a creepy atmosphere I literally couldn't read it at night. When I discovered there was an audiobook version I purchased it so my friend (who is not a reader) could enjoy it with me. At first I thought I would be thrown off by a female narrator on this title but Folly Blaine did a fantastic job with the material! She kept the tone I would've expected and built great atmosphere and suspense without being too dramatic or over the top. It was a really great balance! If you could sum up The Dead of Winter in three words, what would they be? Just short of a Zombie Apocolypse, but, it is not a book about Zombies. It was interesting enough to keep my attention, without being overly gory. While not fighting Zombies in this book, it has the same feel. It is an interesting story, the ending felt a little rushed, but really it ended in the best possible way it could tying up MOST of the loose ends. The book has some gory parts but they are not overly done, just enough. Great story line, felt there could have been more action, but what there was of it was acceptable. This book does drag in a few places, where eye roll happens, but overall not bad. This was an enjoyable listen. Story was engaging and the narration kept me in it. Recommend. Love the book, hate the performance!! If he had used someone else to read the book to us. I have read this book on my own and loved it. However, listing to the woman who reads it on here is like nails on a chalkboard. She has not energy in her and you would think she lost a bet and was forced to read it. She is so bored and boring and has no talent at all! If she does, then she kept it well hidden. No emotion at all. She made a really good book a torture to listen to. What was one of the most memorable moments of The Dead of Winter? When the one man went into the back yard late at night and found his friend standing there. The whole "Oh, hi there" before realizing there is no reason for his "friend" to be there, freaked the heck out of me. Would you be willing to try another one of Folly Blaine’s performances? When I read it on my own it was fear. This time disappointment on how badly she read it to us. Don't bother with this book unless you read it on your own. I hope someday they find someone else to re-read it as it really is a good story and should be done right! Would you try another book from Jack Night and/or Folly Blaine? I might give this author another try. In this particular case, this author got an idea stuck in his head, probably based off of a news tidbit about a since discredited anthropological conclusion and from there it led him on a bad trajectory. Has The Dead of Winter turned you off from other books in this genre? No no no, I like this genre, and this has the bones of a good book, the mechanics of a good book. Have you listened to any of Folly Blaine’s other performances before? How does this one compare? I have not listened to any of Folly Blaine's other performances, and really the narration is fine. Was The Dead of Winter worth the listening time? I listened to the whole book, right to the end. Right to the "what the?" end. This book was a chore to get through. Luckily for me, I had just come off a streak of a few good books, and had another lined up to look forward to. "He then turned around and dropped his plate. On the ground." That should be one sentence, but she reads it as if it ended at plate, and on the ground is another sentence (this is just an example, and not a line from the story). Coupled with her voice, the narrator got to be very distracting. -- Big strong, hero, who has no faults, and then he does. -- Hero's love interest, who doesn't just want to be a damsel in distress, she now wants to be empowered. -- Sheriff, who wants to handle things because this is his town, but then can't and wishes he hadn't. I could go on, but it might ruin some of the "surprise". Yes, there are surprises, but they aren't really a surprise. You can see where the story is going a mile away and the plodding exposition is often tedious. The author does do a good job of mixing up the plot though. We should try this. No this! Now this! Will this work? In the end, I don't think I even cared. I just wanted it over. I will give the author this: he created some creepy scenes. If you can get past the annoying narrator and actually picture the situations as described, you may be slightly disturbed. In fact, coupled with the plot and characters, this book would have made a better movie. That way, we could focus more on the scares and visual creepiness. This is a poorly written tale, full of cliches and recycled ideas. The characters are wooden and one by one act in the way famously parodied by Scream in the 90s. There are one or two creepy moments, but they are taken directly from the character Samara from the ring movies; think of how she came out of the tv and crawled stutteringly across the floor and you have the idea.